You’ll need a few items to get rolling with a tubeless conversion. Here’s a parts list of what you’ll need. It may sound obvious but removing the wheels from the bike is mandatory for this operation since we will be removing the existing tubes and rim strips. First deflate the tubes and then removed tires from the rims. A good pair of tire levers, such as Pedro’s tire levers may come in handy here. Your Gorilla Tape may or may not come in the right width for your particular wheel. 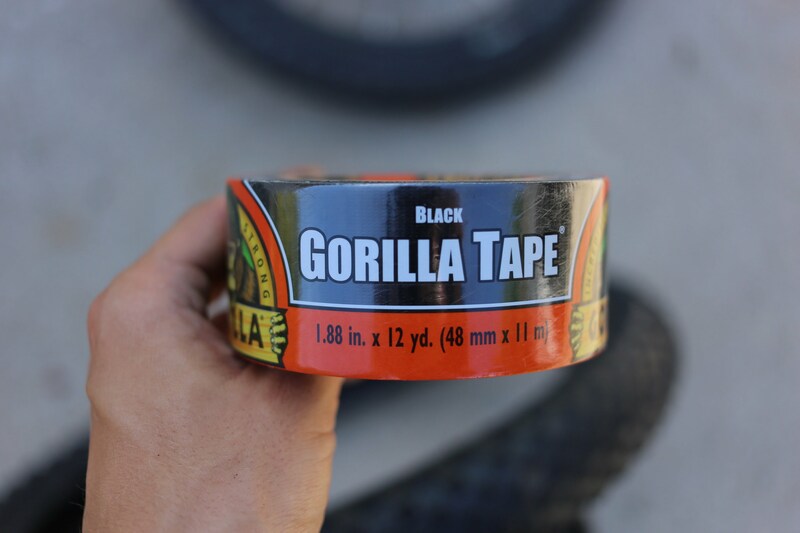 What we need to accomplish with the Gorilla Tape is to cover all of the holes that are in the rim from where the spokes attach to the rim. I needed to cut my Gorilla Tape down which was accomplished with a razor blade. I found this much easier to do before unrolling the tape. After the tape is cut we can carefully apply it to the rim, smoothing and pressing it down as we go. Some people recommend using 2 or 3 layers of tape. I used only one and everything worked just fine. Once the rim tape is applied we can insert the valve stem. First, make a pilot hole for the valve stem with a screwdriver or awl. Be careful not to make this hole too large as we want the bottom of the valve to seal up well against the tape. After the pilot hole is in place, you can remove the locking ring from the valve and insert the valve into the rim. Once you have the valve stem on you can tighten down the locking ring onto the valve. 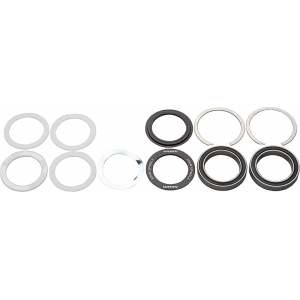 You will want this locking ring to be tighter that what you would do for a tube because the locking ring is the only thing holding the valve in position. I used a pair of pliers to ensure it was good and snug. At this point you can go ahead and reinstall the tire on the rim. Once you have the tire mainly seated on the rim, go ahead and use an air compressor to air up the tire and get the tire beads to seat before adding any sealant. You’ll most likely hear a distinctive “pop” as the bead seats. We use an air compressor for this step as it allows a greater volume of air to be added to the tire quickly in order to get the bead to seat properly. At this point you can also check for any major leaks. The tire will most likely have some leaks but at long as it holds a bit of air you can proceed to the next step. Now comes the fun part. I’ve seen a lot of demonstrations of tubeless conversions that involve trying to pour sealant into the tire with one bead broken off the rim. I don’t understand why anyone would do this. Instead we’ll use our handy Park Tool valve core remover to quickly remove the valve core. You’ll want to deflate the tire before doing this if it is still holding pressure. 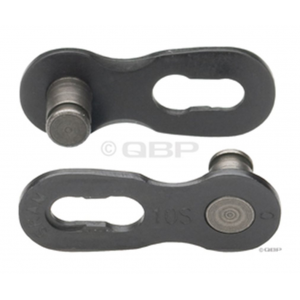 The valve core remover is super easy to use. It is specially designed to engage with the top of the valve and allows you to easily unscrew the core. Once the core is removed, you’ll be left with the empty body of the valve with a hollow middle. You can then grab your syringe and screw the filler tube onto the valve body. After the syringe is attached fill it with sealant to the desired amount and use the plunger to force the sealant in. The amount needed will vary based on the size of your tires and the porousness of their material. For these 20in wheels, I used 1oz of sealant per wheel. Once the sealant is in, put the valve core back in and rotate the tire to start to move the sealant around inside of the tire. Then, air up the tire once again and start shaking that tire. This will distribute the sealant in the tire and ensure a good seal. Reinstall the wheels on your bike and you are ready to rock and roll. I always carry one spare tube with me when I’m running tubeless so if I do have a catastrophic failure I can put a tube in and be on my way. Luckily after completing this process, you’ll have two spare tubes ready to serve as backups! Thanks for the informative write up! Have the same bike for my six year old. He’s also converted to tubeless. Question: What pressure (front/back) is your little guy running? Thanks! Thanks for the response. Yeah, we’ve settled on about 10-12 depending on conditions after a couple of rides. Nice to know we were in the ballpark. Thanks again for the write-up. My boy has enjoyed watching your son ride and has even picked up a few tips by watching. If you or your son are so inclined, you can check out his first ride on youtube under the “Sons of Thunder MTB” channel. Keep the rubber side down! Hey Kevin, thanks for the question. Yes these are the stock tires. The Erik’s guy is right they aren’t technically tubless rated. But they work fine. I used presta stems and they worked fine. Stan’s also sells shrader stems that might fit even better. I’ve used those on another tubeless conversion. I’ve had good success with gorrilla tape, pro mechanics I’ve talked to prefer it and it’s easy to source! Did you use the 35mm or 44mm Revmega presta stem? I used the 35mm version. Which tubeless tires did you use?